Your Spring/Summer digital edition is ready! Des Plaines, Ill. (March 18, 2016)―This May, Batory Foods breaks ground on a 678,000-square-foot facility in Wilmington, IL. There, Batory will launch a new line of business, providing third party logistics services to key suppliers, beginning November 2016. The US Food and Drug Administration released a final rule aimed at enhancing and preserving the wholesomeness of human and animal food products during transport. The final rule implements the Sanitary Food Transportation Act of 2005 (SFTA), which requires that those involved in the transport of animal and food products by rail or motor vehicle follow best practices for sanitary transportation of food products. The rule requires proper refrigeration of food, adequate cleaning of vehicles between loads and proper protection of food during transport, FDA said. BLOOMINGTON, Ind. — Transportation analyst firm FTR reported April 11 that its Trucking Conditions Index (TCI) continued to soften in February due to a weakening of the freight environment early in 2016. The current reading at 8.27 reflects a slowdown in truck loadings from an average of 4 percent thus far in the recovery to 2 percent for the full year 2016, the company said. WTS International has selected the winners of its annual recognition awards for 2016. Each of the six awards will be presented at an awards banquet on May 19 during the 2016 WTS Annual Conference in Austin, TX. 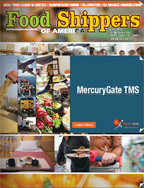 FAIRFAX, VA--(Marketwired - Mar 30, 2016) - InfinityQS International, Inc., the global authority on real-time quality and Enterprise Manufacturing Intelligence, announces that its president and CEO, Michael Lyle, has been recognized on the 2016 "Food Logistics Champions: Rock Stars of the Supply Chain" list. For the second consecutive year, Food Logistics has honored Lyle for his leadership and vision in manufacturing excellence for the food and beverage industry. An unexpected economic detour slammed the brakes on revenue growth at the largest U.S. trucking companies in 2015, sending many companies down the financial equivalent of a runaway truck ramp as inventories piled up, fuel surcharges dropped and freight demand slumped. Year-over-year revenue fell in 2015 at 26 of the enterprises that made the JOC.com list of Top 50 Trucking Companies, a sudden and sharp reversal from strong market growth in 2014, when revenue declined at only two carriers and grew by double-digits at 25 others. Governor John Bel Edwards and the Louisiana Department of Transportation and Development (DOTD) will formally submit the official request for $100 million in FASTLANE grant funding. If approved, the funding would allow the state to complete a nearly 15-mile pavement replacement and lane addition project between the I-10/I-49 interchange and the Atchafalaya Basin Bridge. FASTLANE grants are provided by the United States Department of Transportation (DOT) from their new discretionary grant program called the Nationally Significant Freight and Highway Projects Program. MISSISSAUGA, ON--(Marketwired - Apr 14, 2016) - Axios Mobile Assets (TSX VENTURE: AXA) (OTCQB: AXBSF) ("Axios" or the "Company") announced today that the process it developed to sanitize its pallets after each use has obtained Provision of Sanitation and Hygiene Services certification under the Safe Quality Food ("SQF") Program. Certification was granted following a third-party audit of the sanitization process and facility in Ohio. The certification was awarded to Axios Logistics Solutions, Inc., a wholly owned subsidiary of Axios Mobile Assets Corp. Axios is the world's only pallet pooler to hold SQF certification in this category. Products and facilities possessing SQF certification are recognized globally by retailers, suppliers and foodservice providers for adhering to proven methods that reduce the chance of unsafe food reaching the marketplace. SQF certification is acknowledged by the Global Food Safety Initiative ("GFSI") and aligns the Axios pallet and logistics system with requirements under the U.S. Food and Drug Administration's ("FDA's") Food Safety Modernization Act. Last week, FDA finalized new food safety regulations seeking to ensure the sanitary transport of human and animal food, as required under the Food Safety Modernization Act (FSMA). The final Sanitary Transportation of Human and Animal Food Rule will affect shippers, loaders, carriers and receivers of food transported by rail or motor vehicle in the United States. Among other sanitary controls, the rules will require that vehicles are adequately cleaned, designed to maintain safe temperatures, and operated by personnel trained in sanitary transportation practices and documentation. Most affected entities will have a one-year compliance deadline, with smaller businesses getting an additional year. CLEVELAND, April 13, 2016 /PRNewswire/ -- Ginsberg's Foods, one of the largest family-owned and operated independent food service distributors in the eastern U.S., is upgrading its fleet routing, scheduling, web reporting and GPS tracking capabilities by implementing Appian DirectRoute™ and DRTrack™ Operations solutions from TMW Systems. Serving customers across a six-state region from its Hudson, N.Y., headquarters and warehouse facility, the 107-year-old distributorship is investing in the Appian solutions to increase efficiency, enhance service levels and reduce costs. Ginsberg's is a shareholder in the UniPro Foodservice cooperative. "The Appian solutions are much more user-friendly than our current software and offer significantly greater visibility and control for our dispatcher," said Larry Bigando, transportation manager, Ginsberg's Foods. "We will be able to compare various routing options and their corresponding costs so we can make better, faster decisions that benefit our customers and our bottom line."